Old Leamingtonians' Pauline Dumont. Picture by Tim Nunan. 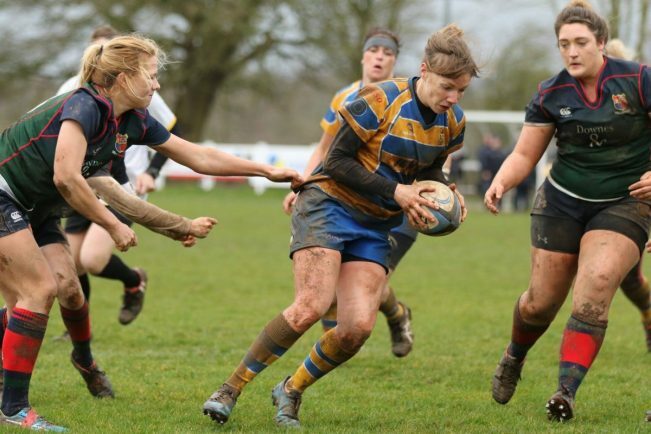 OLD Leamingtonians Ladies put an end to their losing streak to beat Moseley Ladies 34-15 in Women’s Championship Midlands 2 at the weekend. It was just their second win of the campaign as the side remain bottom of the division, and it looked like being another long day for them when the visitors opened the scoring inside the first few minutes. Old Leams hit back quickly through inside centre Kate Whitfield, before Harriett Hillson collected possession and outpaced a number of opponents over half the length of the pitch to go between the posts. Jen Vermeulen added the points from the conversion before scoring a try of her own. OL’s entered half-time with a 17-5 lead after managing to keep out the opposition and withstand their attacking threat. The second-half continued in similar vein to the first, as the hosts went further ahead through winger Sarah Ovenden’s try, before Whitfield added a second of the afternoon. Moseley hit back and worked the ball quickly towards the wing to score in the corner of the pitch, but the hosts were not going to lie down to the visitor’s pressure. Fly half Pauline Dumont capitalised on a scrum to score a converted try, and although Moseley grabbed a consolation try, Old Leams ran out victors. They go into the final fixture of the campaign with some extra confidence, hosting seventh-placed Kenilworth Ladies on Sunday (3pm).